In 2015, I was invited to Volvo’s design studio to see an early concept for its first self-driving vehicle. The studio is 50 miles from downtown Los Angeles, where I live, and very close to an Amtrak station, so I took the train. From the reaction I got when I arrived, you would have thought I just hopped off the hyperloop from Mars. The Swedish automakers in town to show off their work were shocked that I had gotten there using transit. In fact, at least one designer I talked to, who was supposed to be working on solutions for Southern California’s transportation crisis, didn’t even know that trains served this part of the LA region. My trip took a little over an hour, and I got there faster than some people coming from other parts of LA who got stuck in the 101 freeway’s notorious traffic. As I started writing my article on the way home—which I could do because I was riding on a train—I looked at the freeway gridlocked below me and wondered how a self-driving car could possibly improve upon this particular journey. A train was clearly the most efficient way to travel. Three years later, Volvo’s 360c is a real car—or, rather, it’s still a concept, but Volvo built an actual car to show what it could do. It has a fridge and a bar. And a sink with a faucet where you can brush your teeth. The seating configuration shifts into different modes for entertainment or work... or sleep. Yes, it’s got a fold-out bed. Putting aside the fact that all those routes are, or are planned to be, connected by rail options, I had one major concern—how could taking, say, 150 people off a flight and putting them in 150 single-passenger cars possibly be more efficient? It’s true—flying is bad. But commercial airlines are also a form of shared mobility. Simply shifting those trips to single-passenger cars—even electric cars—doesn’t instantly solve the sustainability problem. And for those 150 single-passenger cars to travel the same distance as efficiently as a plane creates many more negative environmental impacts. Let’s look specifically at that LA to San Diego route—a 120-mile route most people I know wouldn’t consider flying anyway—that Volvo wants to disrupt with a self-driving car. During morning rush hour, Google Maps says it will take 2 hours and 15 minutes to drive in moderate traffic from downtown LA to downtown San Diego. 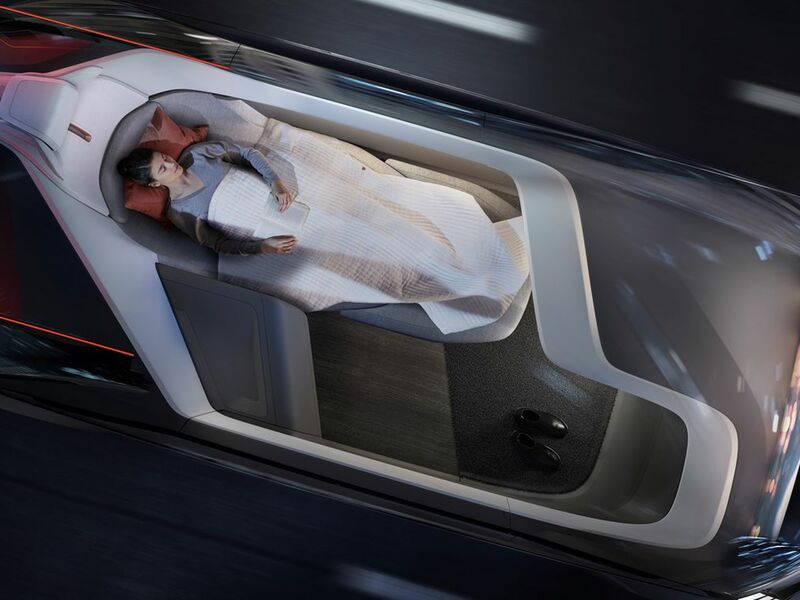 If Volvo’s 360c is designed to replace short-haul flights, why are there literal bedrooms in these cars? There’s also a good existing rail connection. It’s not high-speed, but it’s direct, cheap, and free of the hassles of traveling by plane. The next train will take 2 hours and 45 minutes. That’s not that much of a difference compared to driving. Adding 150 people to this train would be easy. With basic service upgrades and signal prioritization, that trip could be made even more efficient; it could be electrified, it could run more frequently as well. Then those passengers could use shared, zero-emission vehicles or micromobility to get to their destination. Now imagine 150 more cars on the 5 freeway at the same time. The cars would add to the traffic that already exists along the route. The car owners who paid top dollar to avoid traffic would demand to expand the highway. In fact, right now, California is doing exactly this—widening many freeways throughout the region in an effort to accommodate more cars, even though, time and time again, it has been proven that adding more lanes creates more traffic. Even Uber and Lyft have both acknowledged that cars are extremely inefficient ways to get around, offering incentives for rides that start or end with public transit trips, and providing multimodal alternatives for last-mile connections. 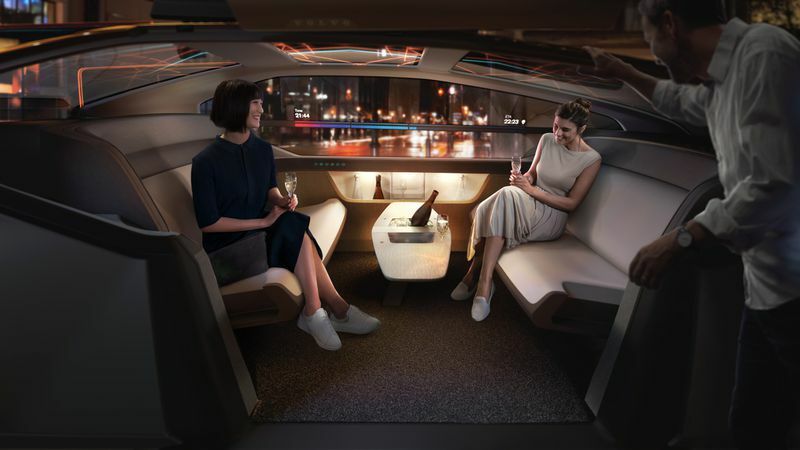 If Volvo’s 360c is designed to replace short-haul flights, why are there literal bedrooms in these cars? Maybe because Volvo doesn’t want to replace short-haul flights. It wants to replace “leading aircraft makers.” It wants to replace airports. It wants to replace flying cars. It wants more cars driving more miles to get “first-class” people where they need to go—in a way that’s fast, safe, secure. Sound familiar? Volvo’s autonomous car seats four—but will it? Unless we fix a whole bunch of other problems with our transportation system, automakers will continue to swoop into our cities and propose new ways for people to use cars. This will in turn lead to building more car-centric infrastructure to support these uses, and we won’t have any kind of hope for addressing the gargantuan amount of space we devote to automobiles, cars’ climate impacts, or traffic deaths. Actually, that’s what gets me the most upset about this concept. Volvo is well-known for championing safety. The automaker is working closely with the Swedish government to eliminate traffic deaths as part of the country’s Vision Zero program, an initiative that many American cities are working to implement as well. If you go to Sweden, you’ll see exactly how this is being achieved: adding more transit options that help people reduce their reliance on cars and designing roadways that better serve a street’s most vulnerable users. I don’t see how the 360c concept fits in with Volvo’s safety claims. Expanding the U.S.’s car infrastructure so “first-class” passengers can drive longer distances runs completely counter to Volvo’s own efforts to eliminate traffic deaths. And its auto execs, from a country that prides itself on its fast trains, reliable transit, and safe streets, should be ashamed for trying to sell our country on an idea of more highways, more driving, and more cars.